You are here: Home / My Book / Hot Off the Press! 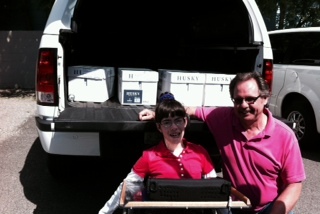 Thursday afternoon, we took dad’s truck to Grey Dog Press and picked up 4 boxes of ‘Free Rein-in with Chester’! Grandma and grandpa Weber met us there to share in the occasion. Many thanks to Russ Davis at Grey Dog Press for all of his help and expertise; and his donation of his time for the printing. We are now hard at work setting up the website so the book can be purchased there, and planning a PARTY! We are going to have a Launch Party on July 11 at the Free Rein Barn. I will keep you informed as to the progress of all that is going on. I just read your book….FABULOUS! Congratulations, you are amazing and I am SO happy for your accomplishment.